Few countries can match India’s diversity, cultural breadth, and beauty. To learn more about its long history – and to gaze upon untold treasures – be sure to venture to the best museums in India. We’ve picked six of our favourites, where you can discover everything from centuries-old textiles to ancient jewellery, miniature paintings to crystal furniture. There’s no better way to further your cultural education while in the Subcontinent. Formerly known as the Prince of Wales Museum, the Chhatrapati Shivaji Maharaj Vastu Sangrahalaya (or CSMVS for short) is Mumbai’s premier museum, and one of the finest cultural institutions in the country. Founded more than a century ago, it houses a vast collection of Indian sculptures, textiles, miniature paintings, decorative objects, and antiquities; Asian and European exhibits are also on display. Easily one of the best museums in India, Delhi’s National Museum is full of priceless masterworks and fascinating artefacts. The collection here is vast and varied, and covers more than five millennia of Indian history. Discover more about India’s past through mementos left behind by ancient kingdoms, historic musical instruments, jewellery, antique coins, arms and armour, and artworks. Given that the museum’s collection contains more than 200,000 objects, be sure to dedicate at least half a day to exploring its galleries. Even if you never venture indoors, the extraordinary City Palace Museum is worth seeking out. Not that you’ll need to look hard: the sprawling icon, whose origins date to the 16thcentury, sits overlooking the waters of Lake Pichola and is one of Udaipur’s quintessential landmarks. But if you do venture indoors the palatial complex, you’ll discover lavishly decorated interiors and an impressive array of antiquities. Hyderabad’s Salar Jung Museum is extraordinary for a few reasons – the fact that it’s officially one of the world’s largest museums, and features more than a million objects in its collection, for instance – but most of all for the fact that its antiquities all originate from the same source: the Salar Jung family. The biggest one-man collection of artworks in the world, it’s nothing short of a cultural colossus. India’s textiles are world-famous for a reason: varyingly vibrant, skilfully embroidered, and printed with colourful patterns, they’re one of the country’s most exquisite cultural legacies. There are few better places to discover India’s fabric-making past (and present) than at the Calico Museum in Ahmedabad, Gujarat. One of the foremost textile museums in the world, it houses a range of pieces that demonstrate five centuries’ worth of techniques, and also includes exhibitions about block-printing, embroidery methods, and fabric-weaving. One of the best museums in India – and also the most beautiful – is the lavish Jai Vilas Mahal, located in Gwalior, Madhya Pradesh. 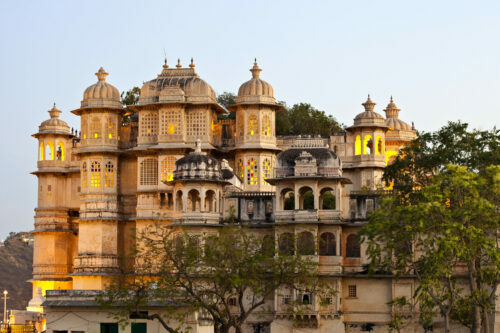 Constructed by a local Maharaja in 1874, it offers a lavish and well-maintained glimpse into India’s royal past. The highlight of the museum is the palace’s Durbar Hall, which is decorated with gold, chandeliers, and one of the largest woven carpets in Asia. Beyond the hall, make sure to discover the extraordinary array of other exhibits, from crystal fountains to marble statues.